R Ashwin spins India to 75-run win over Australia. Ravichandran Ashwin, with a haul of six for 41, spun India to a 75-run win over Australia on Day 4 of the second Test in Bangalore. 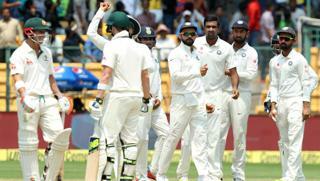 After setting a target of 188, India rode on Ashwin’s spin to dismiss the Steve Smith’s men for 112. The four-match series is now level at 1-1.